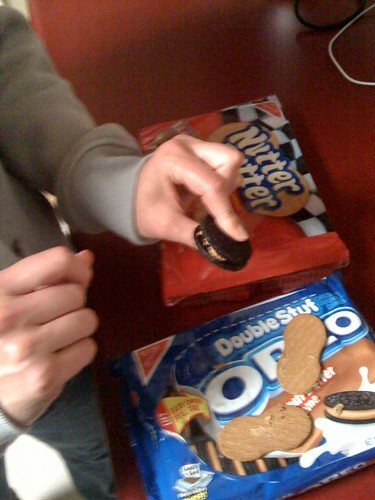 We pulled the cream out of each cookie and performed a transplant of sorts, resulting in an Oreo filled with the guts of a Nutter Butter. As you can imagine it was amazing. However, it was very time consuming and to prevent ourselves from spending the next 16 hours making cookie mashups, we did the honorable thing and ate both bags of cookies in their original form as quickly as we could so as not to be tempted. Feel free to attempt this on your own. This is borderline epic right here. PB Oreos popped up here about 3 weeks ago, and I’ve been enjoying them ever since. But this… Wow. This is outstanding.